Collected from friends and family over the past ninety years! Combine 4" stick of cinnamon, 4 whole cloves, 4 whole allspice and 1 qt. cider. Add several thin slices of orange. Heat covered but do not boil. Hold over low heat at least 15 min. to allow flavors to develop. Combine in blender until smooth and store in refrigerator. Yield 1 1/4 cup. Dissolve the jell-o in hot water. Mix with orange and pineapple juice and freeze. To serve thaw to a slush and add 1 qt gingerale. Will serve thirty punch cups. Beat eggs until thick and creamy. Add sugar, whiskey, salt and nutmeg. Add milk last. Crush fruit completely, one layer at a time, about 2 quarts berries. (If desired sieve half of the pulp to remove some of the seeds.) Measure 4 cups into a very large saucepan. (With strawberries or other fruit lacking tartness, use 3 3/4 C fruit and 1/4 C lemon juice.) Add sugar and mix well. Place over high heat, bring to a full rolling boil, and boil hard for 1 minute, stirring constantly. Remove from heat; at once stir in Certo. Skim off foam with metal spoon. Then stir and skim for 5 minutes to cool slightly and prevent floating fruit. Ladle into glasses. Cover at once with 1/8 inch hot paraffin. Crush berries completely, one layer at a time. Put the crushed berries in a very large saucepan. Add lemon juice and sugar. Place over high heat, stirring constantly. Bring to a full boil (rolling boil that can't be stirred down) and boil for 1 minute. Remove from heat at once and stir in Certo. Skim off foam with a metal spoon. Stir and skim for 5 minutes to cool slightly and prevent floating fruit. Ladle into glasses. Cover with 1/8 inch hot paraffin. Slice fruit very thin. Add water and let stand overnight. Next morning cook until tender. Let stand overnight. Next morning add sugar. Cook until jelly test is obtained. Remove from heat. Skim off foam with a metal spoon. Then stir and skim for five minutes to cool slightly and to prevent floating fruit. Pour into clean hot glasses. Melt shortening in scalded milk. Beat eggs and add 1 cup of cold water, sugar and salt. Dissolve yeast in lukewarm water. Add all ingredients together with flour. Cover and let rise in refrigerator overnight or can be used the same day by letting rise 2 hours. Put down rolls and let rise 2 hours. Bake at 350 degrees for 15 minutes. Stir cornmeal in one cup milk and bring to a boil stirring to keep from lumping. Add other 1/2 C milk, butter, salt, eggs, and add baking powder last. Beat well. Bake 25 minutes at 375 degrees. Sift together 1 1/2 C sifted flour, 1 1/2 tsp baking powder, 1 tsp baking soda, dash of salt, and set aside. Cream in a mixing bowl 1/2 C shortening and 1 C sugar. Add 2 well beaten eggs and blend well. Mash 3 medium bananas. Add flour mixture alternately with mashed bananas, mixing well after each addition. Bake at 350 degrees for 1 hour. Sift together flour, sugar, baking powder and salt. Cut in butter and lard, Gradually add milk and mix with hands. Kneed and roll on floured board to about 1/2 in. thickness. Bake at 450 degrees until done. Slice biscuits and serve with strawberries and whipped cream. Combine dry ingredients; cut in shortening until mixture resembles coarse cornmeal. Add buttermilk, mix by hand to a stiff dough. Turn dough out onto floured surface and knead lightly 3-4 times. Roll dough to 1/4 inch thickness; cut into rounds with a 2 1/2 inch cutter. Bake at 475 degrees for 10 minutes or until golden. Yield 14 biscuits. Sift above ingredients together and mix with 1/2 C water. Put 1 tsp (heaping) lard in med fry pan and let melt. Put balls of cornmeal (size of a walnut) in hot grease and let brown and then turn. Add another spoon of lard to pan and put in 350 degree oven for 20 minutes. Put 1/2 cup water in mixing bowl, add yeast and let soften 5 minutes. Add dry milk, remaining water, sugar, wheat germ, oil, salt and eggs. Beat with electric mixer until smooth. Stir in enough flour to make a soft dough. Turn on lightly floured board and knead for 3-5 minutes. Place dough in greased bowl, brush with oil. Cover with damp towel and let rise 2 hours. Grease baking sheet. Punch dough down. Knead briefly. Divide into 5 portions. Roll each portion into circle about 9 inches in diameter. Cut each circle into 8 pieshaped wedges. Roll up each wedge starting at wide side. Place on baking sheet and shape into crescent. Brush with margarine, let rise 35-40 minutes. Bake in oven preheated to 400 degrees for 10 to 15 minutes. Combine first six ingredients; mix well. Add egg and buttermilk; stir until smooth. Place shortening in an 8 inch cast-iron skillet; heat at 425 degrees for 5 minutes. Remove from oven, and pour hot shortening into batter; mix well. Quickly pour batter into skillet. Bake at 425 degrees for 25 minutes or until golden brown. Yield: 6 servings. Combine first five ingredients in a mixing bowl. Add egg and milk; stir well. Let batter stand 5 minutes. Carefully drop batter by rounded tbsps into deep hot oil (370 degrees). Fry, turning once, 3-5 minutes or until golden brown. Drain well on paper towels. Yield 1 1/2 dozen. Scald above ingredients and cool. Dissolve 1 pkg dry yeast in 1/2 C warm water and 1/2 tsp sugar. Add to cooled mixture. Add 2 C flour and 3 C whole wheat flour, kneed well. Let rise until double in size. Use for rolls or loaf. Pour boiling water over oats, salt and butter, stir rapidly. Let stand for 1 hour. Add yeast which has been softened in warm water. Add molasses and flour. Beat until well mixed. Place in loaf pans and let rise until double. Bake at 350 degrees. Makes 2 loaves. Sift together dry ingredients and add lightly beaten eggs and milk. Mix to a smooth batter beating to eliminate all lumps. Fry on a hot greased skillet. Combine first 4 ingredients in a heavy saucepan; cook over medium heat, stirring constantly, until smooth and thickened. Remove from heat; stir in baking pdw. Beat egg yolks until thick and lemon colored; stir into cornmeal mixture. Beat egg whites (at room temp) until stiff peaks form; fold into cornmeal mixture. Place 1 tbsp butter in a 1 1/2 qt casserole; heat dish at 350 degrees for 3-5 minutes or until hot. Remove from oven; pour batter into dish. Bake at 350 degrees for 30 minutes. 2 1/2 tsp baking pwd. Beat the first three ingredients together and mix in the 2 cups flour (more if necessary). Dough should be very stiff. Roll to 1/8 inch and cut in 1/2 inch strips. Drop a few at the time into boiling water or soup. For soup cook 1 lb beef or chicken and add 1 quart of tomatoes and celery. Combine yeast and warm water. Let set 5 minutes until bubbly. Add to butternmilk. Sift together dry ingredients. Cut in shortening to resemble coarse cornmeal. Add buttermilk-yeast mixture. Turn out and knead 3 to 4 times adding more flour as needed. Roll to 1/2 inch and let rise 45 minutes. Bake at 450 degrees for 10 to 12 minutes. To freeze, bake only 5 minutes. Cool, then freeze. Thaw when needed and bake at 450 degrees for 7 to 10 minutes. Sift together the flour, salt, soda, and baking powder in a large mixing bowl. Add potatoes, shortening, and enough buttermilk to make a dough. Roll to 1/2 inch and bake at 450 degrees until brown. Beat eggs, milk, and oil. Sift flour, salt, and baking powder and add to previous mixture. Batter should be lumpy. Fill muffin cups 2/3 full. Bake at 400 degrees for 15 to 20 minutes. Makes 12 muffins. Combine all ingredients. Beat until smooth. Serve over fruit salads. Makes 1 cup. Melt butter with vinegar and water in top of double boiler. Blend dry ingredients together. Add to above. Add beaten eggs. Cook over boiling water until thick. Mix all ingredients and drop by tablespoons into hot fat and fry until brown. Drain on paper towel. Saute' chopped onions and rice with butter in a heavy skillet until golden brown. Add water with dissolved bullion and cover and cook 30 minutes at very low heat. Rice should be dry and flaky. Mix enough beet water with the other ingredients to make a paste and cook until slightly thick. Pour over cooked beets. Brown beef, onion, salt, and pepper in skillet. Pour off excess fat. Combine the beef and onion mixture and remaining ingredients. Bake in baking pan at 350 degrees for 30 minutes. Melt margarine and bacon drippings in a large heavy skillet. Add sweet potatoes and water; sprinkle sugar over all. Cook uncovered over medium heat, stirring frequently, until potatoes are tender and a thick sauce forms, about 30 minutes. Yield: 4-6 servings. Add 3/4 cup sugar to 1 quart canned tomatoes and cook down for about 15 minutes. Add 1/2 cup bread crumbs, 1 tbsp butter (or 1 tsp butter and 1 tsp bacon drippings), and salt and pepper to taste. Cook slowly for 10 minutes, stirring often. Fry bacon in skillet until crisp. Remove bacon and crumble. Drain off all but 1 tbsp drippings. Add onion and brown lightly. Stir in cornstarch, salt, and mustard. Drain beans reserving 1/2 C liquid. Stir reserved liquid into skillet. Cook, stirring until mixture boils. Blend in brown sugar and vinegar. Add green beans and heat thoroughly. Garnish with bacon. Place above ingredients in pot and cook covered for 10 minutes. Remove cover and cook down. Boil potatoes and let chill, then dice to 1/2 inch cubes. Put 1 cup water in fry pan with 1/4 cup diced onions and let cook for 5 minutes. Add 1 tbsp bacon drippings. Mix together in a cup 2 tbsp vinegar, 1 tbsp sugar, and 1 tbsp flour. Add mixture and 4 cups of diced potatoes to fry pan. Add salt and pepper to taste and heat well. If mixture cooks to dry add a little more water. Sift flour, sugar, baking powder, and salt together. Combine egg, milk, melted shortening and apple sauce and stir into the dry mixture. Drop by spoonfuls into deep shortening heated to 365 degrees. ( an inch square of bread browns in 60 seconds). Fry until golden brown (3-5 minutes). Drain on paper toweling. Sprinkle with powdered sugar if desired, before serving. Cook 1 1/2 hours on medium high or until beans are done and desired amount of liquid has cooked away. Cook until thicker than soup. Mix all ingredients together and fry in oil. Cook the above ingredients until almost done then add 1 tbsp celery salt and 1 tbsp onion salt and salt and pepper to taste. Add 2 tbsp bacon drippings and 2 tbsp margarine. Let simmer until potatoes and carrots are done. Mix broccoli, crumbs, and grated cheese in a baking dish. Mix celery soup and water and pour over previous mixture. Sprinkle with salt and pepper and bake at 350 degrees for 20 minutes. Heat oven to 375 degrees. Combine potatoes, carrots, and onion in a buttered 2 quart baking dish. Blend soup, milk, salt, and pepper and pour over vegetables. Bake covered for 1 hour. Uncover, sprinkle with cheese, and bake an additional 15 minutes, or until cheese is melted. Yield: 8 servings. Cook celery, chicken, and carrots until tender. Add rice and bullion, and enough water to make about 2 quarts of soup. Let come to boil then simmer for 15 minutes stirring occasionally. Salt and pepper to taste. Wash and dry fresh cucumbers. Cover with brine made of 1 cup salt dissolved in 1 gallon of water. Let stand for 24 hours. drain, puncture each cucumber with needle in 2 or 3 places. Simmer the sugar, spices, vinegar, and water for 30 minutes. Add cucumbers and simmer 15 minutes. Pack and seal. Soak squash in ice water with 1/3 C salt for 2 hours. Drain well. Bring all other ingredients to a boil. Pour squash into boiling solution. Boil three minutes after liquid returns to boil. Seal in hot jars. Makes 4 pints. To prepare brine dissolve 1 cup plain salt in 5 qts. cold water ( stir well to dissolve ). Use a stone crock or large glass jar. Place layer of fresh dill and grape leaves then cucumbers (small pickling, under 5 inches) alternating until jar is as full as desired. Put plate or saucer over cucumbers to hold them under the brine. The plate may need to be weighted. Cover with a cloth and let set at room temperature 3-6 days depending on the temperature. After the third day check to see how they are curing. Pickles cure from the outside to the center. According to your taste ( from mild to strong depending on length of cure ) when pickles have cured remove cucumbers and dill from brine and place in glass jars. Make new brine and fill jars to cover pickles then place in refrigerator to store. Will keep up to 4 months. Can be kept without refirgeration but will continue to cure ( more sour and stronger ). Before serving rinse with cold water. Wash enough small pickling cucumbers (under 5 inches, larger ones become soft) to fill seven quart jars. Place head of dill in bottom of each jar, place enough cucumbers in jar to fill half full then place cut-up dill including stalk between and around cucumbers, finish filling jar with cucumbers and place dill between and around them. In each jar place one clove of garlic and 1/8 tsp of granulated alum. Take one quart of vinegar, 1 cup of salt, 3 qts water and mix together and bring to a boil. Pour into jars filled with cucumbers, leave 1/2 inch headspace in each jar. Seal tightly with hot lids, put in hot water bath. Have water hot when you put jars into hot water bath and simmer 30 minutes without boiling. To prevent jars from breaking warm prepared jars before placing in hot water bath. This can be done in a warm oven. Sprinkle a layer at a the time with 1 1/2 cup salt. Let stand 4 hours. Wash 3 times. Let stand in clear water 1/2 hour then wash in clear water once and drain. Put them in a mixture of 3 cups brown sugar, 2 cups vinegar, and 2 pods red pepper cut-up. Put the following spices in a tie of cheesecloth: 3 tbsp mustard seed, 2 tbsp celery seed, or you can use 2 tbsp mixed pickle spices. Boil entire mixture until soft and thick. About 1 hour. Makes 8 pts. Shred hard cabbage and pack into stone jar a layer of cabbage, then a layer of salt using 1/2 lb salt for each 20 lb of cabbage. Pack and press each layer firmly so that the water from the cabbage will rise and cover solids. Weight the cabbage with a plate to keep it under the liquid and cover with a cloth. Remove scum from top of jar each day. When cured pack into jars and process 30 minutes in hot water bath. Wash plums, stick with a needle in 3-4 places. Pack raw in jar. Make syrup by mixing 1 part sugar to 2 parts water and let come to a boil. Pour syrup over plums in the jars. Seal and process in hot water bath. Let boil 20 minutes. Or using pressure cooker 10 min at 5 lbs. pressure. Let sugar and water come to boil. Place peach halves in jar and cover with syrup. Process in hot water bath for 20 minutes or pressure cooker 8 minutes at 5 lb pressure. Pack strung beans in jars and cover with boiling water. Add 1 tsp salt per quart, seal and process in pressure cooker 25 minutes at 10 lb. pressure. Pack in jars and cover with boiling water. Add 1/2 tsp salt per pint and process in pressure cooker 15 minutes at 10 lb pressure. Scald whole tomatoes and skin. Pack in quart jars. Add 1 tsp salt per quart and process in pressure cooker for 10 minutes at 5 lb pressure. Mix well and let stand 24 hours. Combine all ingredients and heat to prepare syrup. Take cucumbers out of lime water and rinse well. Cover with cold water and let set for 2 hours then drain well. Put cucumbers in cold syrup and let stand overnight. Put cucumbers and syrup on stove and let come to boil and simmer for 15 minutes. Place in jar and seal while hot. Cook rind until tender and drain. Mix other ingredients together and bring to a boil. Add rind and boil 2 minutes, set aside. Bring to a boil each morning for 3 days pour in jars and seal. Tie spices in double thickness of cheesecloth and drop into syrup before cooking. Cook onion and garlic in oil until soft, do not allow to brown. Add strained tomatoes, and tomato paste. Simmer for 30 minutes until slightly thickened. Add seasonings. Pour over thin spaghetti. Serve with grated cheese. Drain all vegetables. Combine all ingredients cover and chill. Dissolve jello in 1 cup of hot water. Whip milk, sugar, salt, lemon juice, and grated rind together. Fold into jello with pineapple, cottage cheese, and marshmallows. Let stand over night in ref. Serve on lettuce. Good with ham. Combine all ingredients except cream cheese and cook in top of a double boiler until thick, let cool. Beat cream cheese until fluffy and add cooked mixture. Beat well until blended. Mix all ingredients together and let congeal. Grind fruit then add sugar. Makes 3 pints. Store in a cool place. Mix all ingredients together and refrigerate for 24 hours. Mix together and let set until cool and partially congealed. Add 1 pkg. of dream whip or 1 9oz. container of cool whip. Combine flour and sugar then stir in eggs, then fruit juices. Cook over hot water stir ring until thick. Cool. Whip cream or use ready whip and fold into mixture. In a bowl, mix apples, raisins, walnuts, chutney and mayonnaise. Fold in whipped cream. Spoon mixture into a serving bowl lined with lettuce leaves. Chill until ready to serve. Serve with roast duckling or turkey. Add slices of date nut bread or Boston brown bread and a pitcher of sangria or fruit punch. Drain juice from cherries and pineapple and bring to a boil. Dissolve jell-o in juices. Add coke and chill slightly to thicken, then add fruit and cream cheese cut into small pieces. Add nuts if desired. Refrigerate. Combine and heat while stirring until dissolved. Cool and let start to congeal in refrigerator. Mix together cottage cheese and 8oz cool whip with a dash of salt. Fold into jell-o mixture. Drain 1 cup of pineapple juice for sauce. Mix other ingredients together and chill. Cook over medium heat until thick and chill. Fix dreamwhip as on pkg. and mix with sauce and put on top of jell-o. Dissolve gelatin in boiling water. Add pineapple with syrup; chill until thickened. Stir in coconut. Pour into a 1 quart mold or serving bowl. Chill until firm, about 4 hours. Into 2 cups hot water dissolve 2 pkg apricot jello, 1 pkg cream cheese, then add 1 can crushed pineapple. After this congeals add 1 pkg dream whip fixed according to directions on box. Makes 3 1/2 cups or 6 servings. Combine ingredients with beets and marinate for serval hours. Chill and serve. Wash okra, trim in a cone shape around stem. (do not cut the stem off as this prevents the okra from oozing and becoming slimy.) drain and dry with paper towel. Place in a shallow pan and coat okra with vinegar. Continue to toss lightly and gently while making sauce. SAUCE: Stew enough tomatoes to make a quart or more, add salt and pepper to taste and sugar. Add coriander. Put these ingredients in a large pot which will hold everything in the end. Saute' lean cube beef in vegetable oil. Brown on all sides, add chopped garlic. (Do not let it burn or it will become bitter.) Salt and pepper to taste. Add just enough water to cook meat gently about 1 hour. Add okra, vinegar and stewed tomatoes and continue to cook about 20 minutes or until okra is tender. Handle very gently and do not stir or you will break the okra which is so very tender and you want it to stay whole. Serve over hot steamed rice. In place of beef you can use short ribs, cubed lamb or chicken thighs. Mix all ingredients together. Roll in 1 inch balls. Bake at 350 degrees for 15 minutes. Makes about 50. Sprinkle steaks with pepper and Italian seasoning. Cut carrot and green pepper into 3 X 1/4 in strips. Arrange an even number of vegetable strips in center of each steak. Roll up steaks; tie with string or fasten with wooden picks. Coat a large nonstick skillet with pam; place over medium-high heat until hot. Add steak rolls, and brown on all sides. Mix together hamburger, cracker crumbs, half of tomato sauce, onion salt, pepper, mustard, and 1 tbsp. brown sugar. Form into a loaf. place in baking dish, and top with remainder of tomato sauce, other tbsp. of brown sugar, vinegar, and syrup. Bake in preheated oven at 375 degrees for 35 - 45 minutes. Makes four generous servings. Combine all ingredients except pam and catsup. Coat a broiler pan and rack with pam. Place meat mixture on broiler rack, and shape into a 10 X 6 inch loaf. Spread catsup over meat loaf. Bake at 350 degrees for 1 hour and 10 min. or until done. Yield: 6 servings (about 188 calories per serving). Cut the meat into thin strips. Place in a 2- quart glass casserole. Sprinkle with salt and pepper; add soy sauce. Stir in green pepper, cover and microwave for 14-16 minutes on high. Combine cornstarch and water in a small bowl, stir until smooth; stir in meat mixture. Recover and continue cooking 2-4 minutes on high or until thickened. Let stand covered for 5 minutes before serving. Serves four. Mix first six ingredients with 1/2 can tomato sauce. Shape into a loaf and place in a shallow pan. Combine remaining ingredients, pour over loaf and bake at 350 degrees for 1 hour and 15 minutes. Baste occasionally. Add enough water to crumbs to dampen and combine with other ingredients. Put pieces of chicken in dish with cream of chicken soup poured over. Put dressing in center and cover. Bake at 350 degrees for 1 hour. Sift together flour, baking powder, and salt. Cut in lard until very coarse then add ice water and mix with hands. Kneed into a stiff dough and roll out to 1/4 in thickness and cut into squares. Drop into boiling chicken broth, turn heat to low, boil slow for 15 minutes, stir and let set for 30 minutes. You can add pieces of chicken if you wish or serve with boiled chicken. Combine potatoes, onion, mustard, and salt. Add ham and chill about 1 hour. Shape mixture into 18 patties. Blend milk into egg. Dip patties in egg mixture and then in crumbs. Fry patties in deep hot fat until golden brown. Serve plain or with your favorite sauce. Yield: 18 two inch patties or 6 servings. 1 can (10 oz) hungry jack refrigerated flaky biscuits. 1. In a 3 qt oblong baking dish, combine soup, milk, and pepper. Stir in vegetables and chicken. 2. Bake at 400 degrees for 15 min. or until mixture begins to bubble. Meanwhile, cut each biscuit into quarters. 3. 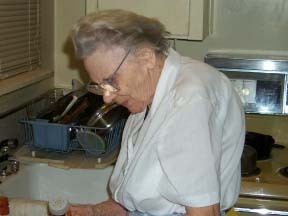 Remove dish from oven; stir. Arrange biscuit pieces over hot chicken mixture. Bake 15 min. or until biscuits are golden brown. Mix and store in ref. overnight. Use 3 loaves of bread. Makes 22 sandwiches. Brown chicken in skillet with a little oil. Put browned chicken in a baking dish. Mix cream of celery soup and water and pour over chicken. Bake at 350 degrees for 30 - 40 minutes or until chicken is tender. Cream margarine and gradually add sugar beating well at medium speed until creamy. Add eggs, one at a time, beating well after each addition. Sift together the flour, baking powder and salt. Add to creamed mixture alternately with milk, beginning and ending with flour mixture. Add vanilla and mix well. This will make 4 cake layers or 3 layers and 12 cupcakes .Bake at 350 degrees for about 30 minutes or until wooden toothpick inserted in center comes out clean. Cool in pans for 10 minutes. Use your favorite frosting. This cake is best if you use The Leader Flour from Beaver Pond Mill, Amelia, Va. Freezes well. Mix dry ingredients, add butter, sugar, egg yolks, flavoring, and sour cream. Mix well. Fold in egg whites which have been beaten stiff. Bake at 300 degrees for 1 1/2 hours. Place dates in a small bowl; sprinkle soda over dates. Cover with boiling water and set aside. Cream brown sugar and shortening in a large bowl. Add salt and egg; beat well. Add nuts and date mixture; mix well. Stir in flour. Spoon into a 9-x5-x3-inch loaf pan. Bake at 325 degrees for 1 hour or until done. Yield one loaf. Mix the above ingredients and pour into a heavy pan containing 2 tbsp melted butter, 1 C brown sugar, 1 C almonds, and 1 C of pineapple. Bake at 350 degrees for 30 minutes. Combine butter and brown sugar creaming until light and fluffy. Add egg yolks. Sift together flour, soda, baking powder, nutmeg, cloves, and cinnamon and add alternately with preserver and buttermilk. Fold in egg whites and bake for 30 minutes at 375 degrees. Cream the cottage cheese gradually add sugar beating until smooth. Add egg yolks one at a time beating well after each addition. Add vanilla and beat for 15 minutes. Carefully fold stiffly beaten egg whites into mixture. Pour into pie pan ( no crust ) and bake at 450 degrees. Do not peel cucumbers. Mix ingredients together, put in refrigerator several hours (up to 24). Stir occasionally. Put in freezer bags and freeze. Thoroughly blend crumbs and margarine with 1/3 C sugar and press firmly against bottom and sides of 8 inch springform pan. Beat cream cheese until fluffy. Gradually add remaining 1 C sugar and vanilla . Beat in eggs one at a time. Blend in sour cream. Spread in prepared pan. Bake in preheated oven at 350 degrees for 60-70 minutes or until firm. Turn off oven. Leaving door slightly ajar, allow cheesecake to remain in oven for 1 hour. Cool in pan. Chill 4 hours or over night. Remove side of pan and top with pie filling. Sift dry ingredients together. Make hole in center and break eggs. Add water and extract. Beat well. Bake 30 minutes at 350 degrees. In a mixing bowl cream butter. Gradually add sugar and beat until light and fluffy. Beat in eggs, one at a time. Combine flour, baking powder, salt, baking soda, cinnamon, and ginger. Reserve 1/4 cup flour mixture. Add remaining mixture to creamed mixture alternately with applesauce. Toss dates and nuts in reserved flour mixture. Stir date and nut mixture into batter. Turn into buttered 9 x 5 x 2 3/4 inch loaf pan. Bake in preheated 350 degree oven 60-70 minutes. Cool pan on wire rack 10 minutes and turn out of pan to cool completely. This cake makes a nutritive snack for the children after school. They'll love it spread with butter. Cream margarine and butter. Add brown sugar a little at a time. Beat well. Add white sugar and beat until light and fluffy. Add eggs one at a time beating well after each addition. After all eggs are in beat for 3 more minutes. Sift baking powder and salt with flour. Then add to creamed mixture alternately with milk. Add vanilla and nuts last. Bake in a tube pan for 1 1/2 hours in 325 degree oven. Flour the chopped nuts with 1/2 cup of the 2 cups flour. Cream butter and sugar until fluffy; add eggs one at a time, beating well after each addition. Add flour alternately with the milk and vanilla; stir in the floured nuts. Bake in a greased loaf pan, about 9 x 5 x 3 inches , in a preheated oven (300) for about 1 hour and 30 minutes. Thrust a straw into the center, if it comes out clean the cake is done. When cool, ice with browned butter frosting. Cream butter and sugar until light and fluffy. Sift dry ingredients together 3 times. Add milk and flour alternately to other mixture. Beat eggs to lemon color and stir into cake batter. Melt chocolate in double boiler and with vanilla , add to other mixture. Makes 2 layers. 350 degree oven. Toast one cup chopped pecans in 4 tablespoons butter, stirring constantly. Remove from fire, add 6 tablespoons cream , add 3 cups confectioner's sugar. Stir until smooth. Add dash of salt, 2 tsp vanilla. Spread between layers. and sides of cake evenly. Cream sugar and shortening thoroughly and add egg. Sift flour, baking powder and salt together and add to the first mixture alternately with the liquid. Pour into a greased and floured loaf pan and bake in a moderate oven (350) for abour 40 minutes. Or bake in layers if desired. Ice with seafoam icing. Combine all ingredients in large mixer bowl. Blend; then beat at medium speed of electric mixer for 4 minutes. Pour into greased and floured 10 inch tube or fluted pan. Bake at 350 degrees for 55-60 minutes or until cake springs back when lightly pressed. (For 13 x 90 inch pan bake 45-50 minutes.) Do not underbake. Cool in pan for 15 minutes. Remove from pan and finish cooling on rack. Sprinkle with confectioners' sugar, if desired. Cut up fruit, nuts, and raisins. (I cut raisins with scissors.) Cream butter and sugar, add beaten egg yolks. Beat egg whites until stiff and fold into mixture. Dredge the cut fruit and nuts in half of the flour. Sift together the remainder of flour, soda, spices, and salt. Add milk and sifted dry ingredients alternately to cake batter. Add nuts and fruit. Mix well. Line large tube pan with waxed paper and fill with fruitcake mixture. Tie 3 thicknesses of waxed paper over pan to keep out moisture. Put 2 1/2 cups of water in bottom of cooker. If you use 2 small tube pans , put 1 in bottom of cooker and the other on rack. Cook 45 minutes at 10 pounds of pressure and 35 minutes at 15 pounds of pressure. When done, uncover cake by taking waxed paper off. Place in slow oven for 12 minutes to dry. Store in an airtight container for 3 or 4 weeks before using. Melt chocolate in boiling water. Cool. Cream butter and sugar until fluffy. Add egg yolks one at a time, and beat well after each. Add melted chocolate and vanilla and mix well. Sift together flour, salt and soda. Add alternately with buttermilk to chocolate mixture; beat well. Beat until smooth and fold in egg whites. Pour into 3 deep 8-9inch layer pans lined on bottom with paper. Bake at 350 degrees for 30-40 minutes. Cool. Frost tops only. Combine 1 C evaporated milk, 1 C sugar, 3 egg yolks, 1/2 C margarine, 1 tsp vanilla. Cook and stir over medium heat until thickened, about 12 minutes. Add 1 1/3 C coconut and 1 C chopped pecans. Beat until thick enough to spread. Makes 2 1/2 cups. Mix oatmeal and water and let stand 20 minutes. Add sugars and butter, then remaining ingredients. Bake in greased and floured 9 x 13 inch pan at 350 degrees for 30 minutes or until test done. Mix 1/4 C evaporated milk, 6 tbsp butter, 1/2 C br sugar, 1 tsp vanilla and 1 can coconut. Spread on warm cake and brown under broiler. Combine all ingredients mixing for four minutes. Bake at 350 degrees for 50 minutes. Mix 1 C sifted powdered sugar and 1/2 C lemon juice and pour over cake while in the pan hot. Add dry ingredients to liquid mixture. Then add 3 cups fresh apples (diced) and 1 C grated pecans. Mixture will be thick. Bake at 350 degrees. Sift dry ingredients. Combine with other ingredients in bowl and beat well for 2 or 3 minutes. Bake cake in a greased pan 9 3/4 x 9 3/4 x 2 inches or in two 8 1/2 inch layer pans at 350 degrees for 30 minutes. Heat oven to 375 degrees. Stir together flour and pdw sugar; set aside. Beat egg whites, cream of tartar, and salt in large mixer bowl on medium speed until foamy. Add granulated sugar, 2 tbsp at a time, beating on high speed until meringue holds stiff peaks. Gently fold in flavorings. Sprinkle flour- sugar mixture, 1/4 C at a time, over meringue, folding in gently just until flour- sugar mixture disappears. Push batter into ungreased tube pan, 10 x 4 inches. Gently cut through batter with spatula to remove air bubbles. Bake until top springs back when touched lightly with finger, 30-35 minutes. Invert pan on funnel; let hang until cake is completely cool. Mix well and add 3 cups of grated carrots. Bake for 40 minutes at 350 degrees. Makes 3 layers or 1 large loaf. Mix 1 stk margarine with graham cracker crumbs and spread into a 13 x 9 inch pan. Beat together for 7 minutes: eggs, 1 stk margarine, and pdw. sugar. Spread on cracker crust. Cover with split bananas and drained pineapple. Top with whip cream then cherries and nuts. Sift dry ingredients together then add shortening, sugar, buttermilk, and banana. Mix enough to dampen flour then beat 2 minutes. Add eggs and then nuts. Bake at 325 degrees. Sift dry ingredients together and stir in oats. Beat applesauce, oil, eggs and milk together. Make a well in dry ingredients and pour in applesauce mixture and stir only until moist. Pour into a greased 9 x 5 x 3 loaf pan and bake 350 degrees for 55 minutes. Mix butter, crisco, sugar, and eggs until creamy. Add flour a little at a time alternating with milk. Then add flavoring. Bake in a tube or bundt pan at 325 degrees for 90 min. or until done. Cooking time may need to be adjusted according to oven. Place karo, egg whites., sugar, and salt in top of double boiler. Beat with rotary beater until partially mixed. Place over rapidly boiling water and cook, beating constantly until frosting stands in peaks (about 3-4 minutes). Remove from heat and continue beating 1 minute. Add flavoring and beat in well. Makes enough to cover top and sides of two 8-9 inch layers. Substitute blue label Karo for white Karo and brown sugar for white sugar. Combine ingredients. Spread over warm cake and brown under broiler. Cook until it forms a soft ball. Beat and add pecans. Let come to a boil until sugar melts. Drizzle over cake. Cream together and spread over cake. Heat margarine, sugar, and water. Mix together cornstarch and lemon juice, then add eggs and beat well. Slowly add this mixture to the heated mixture and simmer for 5 minutes. Do not boil. Pierce cake with a fork and pour sauce over cake. Melt butter in saucepan. Add brown sugar; cook over low heat 2 minutes, stirring constantly. Add milk and cook and stir until mixture comes to a boil. Remove from heat and cool about 10 minutes. Gradually add confectioners' sugar until frosting is of right consistency to spread, beating well after each addition. Makes enough to cover tops and sides of two 8 inch layers (generously) or tops and sides of two 9 inch layers. Cook until thick - no longer than 2 minutes - beat until cool, add powdered sugar as needed. Double this for a 3 layer cake. Cream butter add 1 C of sugar gradually. Cream well and egg and blend. Add remaining sugar, alternately with milk, beating well. Add salt, chocolate, and vanilla. Beat until smooth. Boil sugar and water without stirring until syrup spins a thread. Pour hot syrup slowly into beaten egg white, beating constantly. Add baking powder when icing foams. Spread on cake and sprinkle with 3/4 C chopped pecans. Heat butter to golden brown, stirring constantly. Remove from heat, cool slightly and blend in sugar, vanilla and milk. Add hot water and stir until cool and of the consistency to spread. Combine butter, sugar, and milk, bring to a boil and boil for 1 minute. Remove from heat and add chocolate chips and stir until melted. Put on cake while warm. Melt together one 6 oz. pkg. chocolate chips and one stick margarine. Add 2 cups sifted confectioners sugar and 1 1/3 C evaporated milk and 1 tsp vanilla. Stir and boil 8 minutes. Use over ice cream or cake. Combine ingredients adding slightly beaten eggs last. Bake at 340 for 10 minutes then at 350 until done. Add pecans if desired. Place all ingredients in a plastic bag and shake until all pieces are coated. Put in unbaked pie shall and dot with 1 tablespoon of butter. Bake at 350 degrees until apples are tender when pierced with a toothpick. Cook one quart May cherries sweetened (if not sweetened add 1 1/2 C sugar). Drain cherries after they have cooked for 10 minutes. Take the drained syrup and add 1/2 C sugar and 5 tbsp cornstarch. Cook until thick then put cherries and cooked syrup in an unbaked pie shell and bake at 350 degrees. Prepare 1 package (4 1/2 oz) Jell-O Chocolate Instant Pudding as directed on package, using only 1 cup milk. Blend in 1 1/2 cups thawed cool whip and 1/4 cup chopped nuts. Spoon into a cooled baked 8-inch pie shell. Garnish with 1/2 cup cool whip. Sprinkle with additional nuts if desired. Chill at least one hour. Mix together 2 cups boiled sweet potatoes and 1 1/2 cups sugar. of each of the following: salt, cinnamon, ginger, nutmeg, and allspice. Mix well. Pour into 2 pie crust and bake at 350 degrees for 50 minutes. Mix well. Bake at 350 degrees for 45 minutes. Combine all ingredients except eggs and pecans. Mix well then add eggs and pour into pie crust. Sprinkle pecans on top. Bake at 350 degrees for 45 minutes. Combine all ingredients except milk and bring to a boil and let cool. Whip milk with a little lemon juice and combine with cooled mixture. Pour into vanilla wafer crust. Makes two pies. Mix well and bake at 350 degrees for 30 minutes or until firm. Makes 3 nine inch pies. Mix 2 C sugar with 10 tablespoons flour. Fill unbaked pie shell about half full of blueberries and sprinkle mixture over berries. Sprinkle with cinnamon and dot with butter. Bake at 350 degrees for 45 minutes. Heat fruit. Melt butter in deep baking dish. Mix sugar, flour, milk, and baking powder and pour mixture over melted butter. Pour fruit on top and bake at 350 degrees for 25 minutes. Grate 1 tbsp peel and squeeze 1/2 cup juice from lemons. Set aside. In a 2 quart saucepan, combine cornstarch and 1 cup sugar; with wire whisk, gradually stir in 1 1/2 cups cold water and egg yolks until smooth. Cook over medium - low heat, stirring constantly, until mixture thickens and boils; boil 1 min. Remove from heat; stir in lemon juice and peel, pour into pie plate (with or without crust). In a small bowl, with mixer at high speed, beat the four egg whites and cream of tartar until foamy, Gradually sprinkle in 1/3 cup of sugar, 1 tbsp at a time, beating well after each addition. Continue beating until whites stand in stiff peaks. Spread meringue over hot filling to edge of crust; swirl meringue with back of spoon to make attractive top. Bake at 350 degrees 25 to 30 min. or until meringue is browned. 2nd temperature in meringue center is 140 degrees or above on an instant read cooking thermometer. Cool pie on a wire rack away from draft. Makes 8 servings. Combine all ingredients mixing well. Makes three pies. Prepare whipped topping mix with 1 cup of milk and the vanilla as directed on package, using large mixing bowl. Add remaining 1 3/4 C milk and the pie filling mix. Blend; then beat at high speed for 2 minutes, scraping bowl occasionally. Spoon into baked pie shell. Chill at least 4 hours. Mix cornstarch, sugar and salt thoroughly in saucepan. Add hot water and cook over high heat, stirring constantly, until thick and clear. Remove from stove and add beaten egg yolks. Return to stove and cook at low heat, stirring constantly, for six minutes. Take off stove and add lemon juice and butter. Cool. Pour into cooled baked pastry shell. Top with meringue. Bake in unbaked pie shell at 375 degrees for 45 minutes. Sift together cornmeal and sugar. Beat egg yolks with lemon juice and add sugar mixture, butter, and cream. Beat egg whites stiff with a pinch of salt and fold in last. Pour into shell and bake at 350 degrees for 20 minutes. Makes two pies. Prepare 1 pkg (6 serving size) Jell-O vanilla instant pudding and pie filling with 2 1/4 cups of milk. Set aside 1 cup filling. Pour thin layer of remaining filling into cooled , baked 9 inch pie shell. Slice 1 1/2 bananas; arrange on filling. Top with rest of filling. Blend 1/2 cup thawed cool whip into other cup of filling and spread over top. Chill three hours. Melt butter and add to sugar and flour. Beat in eggs and add vinegar and vanilla. Bake at 350 degrees for 45 minutes. Combine and press in 9-inch pie plate or pan. Bake at 375 degrees for 10 minutes. Makes 1 crust. Beat egg whites and cream of tartar until stiff. Gradually add sugar. Spread on pie and bake at 400 degrees until brown. Sweeten one quart of cherries with 1 1/2 cups of sugar. Drain the cherries after they have been cooked for 10 minutes. To the cherry syrup add 1/2 C sugar and 5 tbsp cornstarch and cook until thick. Put cherries and cooked syrup in unbaked pie shell and bake at 350 degrees. Mix flour with sugar. Add salt. Mix well. Add to mixture 2 beaten eggs. Beat well. Add cocoanut and beat well. Add melted butter and vanilla and beat well. Bake at 375 degrees in pre-heated oven for about 30 minutes. Mix cornstarch with sugar. Add salt. Mix well. Add to mixture 5 beaten eggs. Beat well. Mix soda in buttermilk and add to above mixture. Beat well. Add cocoanut and beat well. Add melted butter and beat well. Bake at 350 degrees for about 40 minutes. Makes two pies. Mix together 3 cups baked sweet potatoes and 4 cups sugar. Blend in 3 eggs, 3/4 stk margarine melted, 1 cup milk, and 1/4 tsp of each of the following spices: cinnamon, ginger, nutmeg, allspice. Mix well. Pour into 3 pie crust and bake at 350 degrees for 50 minutes. For potato coconut pie do not use spices; substitute 2 tsp coconut flavoring and 2-3 cups grated coconut. In a large bowl beat eggs until foamy. Add flour and sugar and beat until well blended. Blend in melted margarine. Stir in chocolate morsels and nuts. Pour into pie shell. Bake at 325 degrees for 1 hour. Remove from oven. Serve warm with whipped cream or ice cream. Mix all ingredients and place in shell and bake. Mix potatoes and sugar then add melted margarine, and other ingredients. Pour in shell and bake at 350 degrees for 45 minutes. Makes 3 pies. Combine flour, cornstarch, and sugar; cut in margarine with fork or pastry blender until mixture resembles coarse meal. Add beaten egg, and stir with a fork until all ingredients are thoroughly moistened. Coat a 14 1/2 X 12 inch baking sheet with Pam. Shape dough into a ball, and place directly on baking sheet, Roll pastry into a 10 1/2 inch circle; trim edges. Bake at 400 degrees for 8 to 10 min. or until lightly browned. Cool on baking sheet 10 min. ; then carefully remove to wire rack to complete cooling. Place pastry on a serving platter, and arrange fruit attractively over top; spoon Citrus Glaze evenly over fruit. Refrigerate tart at least 1 hour before serving. Yield 10 servings (about 170 calories per serving). Put 1/2 milk and 1/2 sugar in blender and grate adding a few pieces of potato at the time. Repeat for other half. Add other ingredients and mix well. Bake at 350 degrees for about 45 minutes. Using a large mixing bowl mix together 6 eggs beaten, 1 cup sugar, 1/2 tsp salt, 1 quart milk, and 5 cups grated sweet potatoes. Add 3 tbsp melted margarine, 1/4 tsp ginger, 1/4 tsp cinnamon, and 1/4 tsp allspice. Mix well and bake at 400 degrees for 15 minutes. Remove from oven and stir. Bake another 45 minutes at 350 degrees. Combine eggs, sugar, and salt. Slowly add milk and vanilla, blending well. Pour mixture into a 1 quart casserole or individual custard cups; sprinkle with nutmeg. Place casserole or cups in a shallow pan with a small amount of water. Bake at 325 degrees for 30 to 40 minutes or until knife inserted halfway between center and edge comes out clean. Serve warm or chilled. Yield 4 servings. Mix orange slices, sugar, and water. Heat and let boil then put in apples and cook over medium heat until apples are done. Add sugar to beaten eggs and salt. Reserve 1/2 C milk and add rest to previous mixture. Cook over hot water. Add cornstarch to reserved milk and add to cooking mixture after it has gotten hot. Cook stirring occasionally until custard coats the spoon. Mix 1 C flour, 1 C chopped nuts, and 1 stk margarine. Spread on bottom of a pan and bake at 350 degrees for 15 minutes. Let cool. Mix 8oz cream cheese and 1 C powdered sugar. Fold in 1 C whipped topping. Spread on top of crust mixture. Cook over medium heat 2 small boxes butterscotch pudding with 3 C milk. Cool and spread on top of step II mixture. Top with cool whip. Combine first four ingredients and mix well, top with crumbs and margarine and bake in greased dish (6" x 6"). Bake at 350 degrees for 30 min. As it cools form into a ball. Beat eggs, add sugar, salt, bread crumbs, and vanilla. Add milk and mix well. Pour into baking dish and add 1 tbsp margarine. Bake at 350 degrees for 10-15 minutes uncovered. Stir mixing melted margarine and bake another 30 minutes. For microwave, 10 minutes on med. high, then stir and bake another 20 minutes on med high. Arrange fresh sliced apples in baking dish and sprinkle with sugar and cinnamon. Sift together 1 cup sugar, 1 cup flour, 1 tsp baking powder, 3/8 tsp salt, and egg beaten with 1 tbsp. water; mix well. Spread this mixture over apples then drizzle 1/4 cup melted butter over all. Bake at 350 degrees until apples are tender. Position knife blade in food processor bowl. Add half each of powdered sugar, peanut butter, and butter; top with cover. Process until thoroughly mixed. Shape into 1-inch balls; chill. Repeat process.Combine chocolate and shortening in top of a double boiler; bring water to a boil. Reduce heat to low; simmer until chocolate melts. Dip each ball in chocolate until partially coated; place on waxed paper until chocolate hardens. Store in an airtight container in refrigerator. Yield about 7 dozen. Mix together sugar and jell-o and add boiling water. Chill milk in ice tray. Set jell-o mixture in refrigerator to cool. When milk is chilled add juice and whip with mixer. Pour jell-o into whipped milk beating well. Pour mixture into dish lined with cookie crumbs. 1 stk melted butter, 1 C flour, 1/2 C chopped pecans. Stir together and spread over bottom of 8 x 10 pryex dish. Bake at 350 degrees for 20 minutes. Cool. 8oz cream cheese (softened), 1 C sifted powdered sugar, 1 C cool whip. Beat cream cheese and add sugar then cool whip. Spread over bottom layer. 2 small packages instant chocolate pudding, 3 cups cold milk. Combine and mix 2 minutes on low speed. Spread on top of second layer. Whip egg white until stiff. Add sugar and salt and beat 3 minutes. Mix pecans until coated. Separate onto a greased cookie sheet and bake at 325 degrees about 15 or 20 minutes. Cream margarine, sugar, milk, egg, and vanilla. Sift dry ingredients and add to beaten mixture. Can be refrigerated for better handling. Roll in small balls and place on cookie sheet. Press each ball down with a glass dipped in sugar. Bake at 350 degrees until lightly browned. Cream together sugar and margarine. Add beaten egg. Sift together baking pdw and flour and add to above mixture. Stir in nuts. Drop by spoonfuls on a greased baking sheet. Bake at 350 degrees until brown. Preheat oven to 375 degrees. Spray cookie sheets with pam. In a large bowl combine dry ingredients. Stir in egg whites, Karo and vanilla until well mixed. Add raisins. (Batter will be stiff) Drop by rounded teaspoonfuls onto prepared cookie sheets. Bake 10 min. or until firm. Do not overbake. Remove; cool on wire rack. Makes 2 1/2 dozen. Cream together shortening, sugar, and eggs then add vanilla. Sift dry ingredients and add to mixture; roll very thin and cut into shape. Bake at 350 degrees until brown. Beat eggs and blend in sugar and melted butter. Sift together flour, baking powder, soda and salt. Stir into egg mixture. Stir in rest of ingredients (add water to moisten well). Mix thoroughly. Drop onto greased baking sheet. Bake in moderate oven (350) for about 15 minutes. Makes 6 dozen. Cream together shortening and sugar then add egg and vanilla. Sift flour, salt, and baking powder and combine with above mixture. Put half of dough in 8" square pan and spread on any kind of jelly or preserves. Top with remaining dough. Bake at 350 degrees for 25 minutes and cut in squares. Combine and mix until smooth. Make into rolls and wrap in wax paper. Refrigerate and slice to bake at 350 degrees until lightly browned. Mix first four ingredients. Cream shortening add sugar and egg. Add to dry ingredients with milk and vanilla. Add nuts. Drop by teaspoon on greased pan. Bake at 375 degrees for 8-10 minutes. Remove from oven. Put cut side of half marshmallow down on cookie. Press down. Return to oven until marshmallow is puffy and soft. Cool. Dip in glaze. Glaze: 1/2 C cocoa and 1 1/2 cup confectionery sugar. Heat 3 tablespoons water and 1/3 cup margarine. Mix with sugar and cocoa. Dip cookie in glaze. Makes about 4 dozen. Mix sugar, cocoa, milk and margarine in saucepan. Boil for one minute. Remove from heat. Stir in oats, peanut butter and vanilla. Drop from teaspoon onto waxed paper. Combine butter, sugar, molasses, and egg; beat well. Combine remaining ingredients except sugar; add to molasses mixture, mixing well. Chill. Roll into 1-inch balls; roll in sugar. Place 2 inches apart on greased cookie sheets. Bake at 375 degrees for 8 to 10 minutes. Yield 3 dozen. Add 1 cup water to 2 cups raisins and boil for 5 minutes. Cool. (Very important that they be cold.) Cream 1 cup shortening and add 2 cups sugar. Add 3 eggs and beat well. Add 1 tsp vanilla and cooled raisin mixture. Sift together 4 cups of flour, 1 tsp baking powder, 1 tsp soda, 2 tsp salt, 1/2 tsp cinnamon, 1/4 tsp nutmeg, and 1/2 tsp all spice. Blend well. Drop by teaspoon on a greased cookie sheet. Bake 12-15 minutes at 350 degrees. Sift together dry ingredients. Beat together shortening, sugar, br sugar, eggs, and vanilla until fluffy. Blend in peanut butter. Add dry ingredients and stir in peanuts and chocolate chips. Shape into small balls; place on ungreased baking sheet. Flatten with a glass dipped in sugar. Bake at 350 degrees for 8 minutes or until brown. Makes 7 dozen. Melt caramel and milk in double boiler. Add pecans. Drop by teaspoon onto greased cookie sheet. Chill or leave to cool completely. Melt wax & chocolate. Dip caramel & nut pieces in chocolate. Yeild 3 doz. Mix all ingredients and form into balls. Melt over hot water 1 block of german chocolate and 1/2 block wax. Dip balls into chocolate and put on wax paper. Combine sugar, milk, marshmallows, butter, and salt in saucepan and cook over medium heat stirring constantly until mixture boils. Boil 5 minutes stirring constantly. Remove from heat. Add chocolate chips stirring until melted then add vanilla and nuts stirring well. Spread evenly in a buttered 8" sq. pan. When cool cut into 1" squares. Yield 4 dozen. Heat the dates, margarine, and brown sugar over low heat for about five minutes or until well blended. Remove from heat and add rice crispies and mix well. Let cool to handle and roll into balls and then roll in coconut. Melt 2 6oz. pkgs. butterscotch chips and 1 tbsp peanut butter; add 2 small cans of chow mein noodles and mix well. Make into size lumps you desire and let cool. Heat oven to 250 degrees. Melt butter in a shallow pan over low heat. Stir in worchestershire sauce and seasoned salt. Add chex and nuts. Mix over low heat until all pieces are coated. Heat in oven 45 minutes. Stir every 15 minutes. Spread out on absorbent paper to cool. Yield 6 3/4 cups. If unsalted nuts are used double the amount of salt used. Grind raisins twice. Mix margarine, karo, raisins, and crumbs by hand until well blended; chill. Pinch off pieces the size of a large olive and wrap each piece around a pecan half. Roll in powdered sugar. Work with a small amount at the time, keeping the balance in the refrigerator, as it will get too soft to work with if left out for a while. Bring above ingredients to a boil and stir in 1 cup crunchy peanut butter. Pour over 6 cups rice krispies and mix well. Pour into a greased 9 x 15 inch dish. Combine sugar, peanut butter, graham cracker crumbs and margarine. Mix until well blended. Make into small balls. Chill for 1 hour. Coarsely chop chocolate and paraffin. Place in double boiler over simmering water. Heat until melted. Using a toothpick dip balls into chocolate quickly. Place on waxed paper. Makes 4 dozen. Combine popcorn and peanuts in a lightly greased roasting pan. Mix well and set aside. Melt butter in a large sauce pan and stir in sugar and corn syrup. Boil for five minutes, stirring occasionally. Remove from heat and stir in soda, salt, and vanilla. Pour over popcorn mixture, stirring until evenly coated. Bake at 250 degrees for 45 minutes, stirring every 15 minutes. Stir in raisins and bake another 15 minutes. Allow to cool and store in a airtight container. Yield 2 1/4 quarts. Beat eggs, add sugar, salt, mix well - add milk, rice, bread crumbs, favoring, and melted butter. Bake at 400 degrees for 15 minutes - stir - bake at 350 degrees for 20 minutes. Dissolve Knox gelatin in cold water, drain canned fruit and use 3 cups juice (or hot water) to make jello. Sprinkle fruit fresh on apples and bananas. Combine all. Combine sugar, cornstarch, Jello, and salt. Add water. Cook until clear. Place glass mixing bowl in microwave, cook on high 5 min. stir, cook 2 min. stir, cook 1 min stir, if not clear continue. Closely cover the cooled pie shells one layer deep with fruit. Pour Jello mixtue into pie shells covering fruit. Refrigerate. Can be covered with Cool Whip prior to serving. Sift flour, baking powder, a dash of salt and 1 cup of sugar. Add milk. Melt margarine in casserole in oven. Add batter. Heat fruit with the other cup of sugar in a saucepan. Stir well and pour over batter. Bake uncovered 25 minutes at 350 degrees or until brown. Place dish on cookie sheet to prevent spills in oven. 1 lb. beef - cubed - bottom round steak, etc. Combine all above with enough water to cover and pressue cook for 20 min. return to boil until noodles and rice are tender.